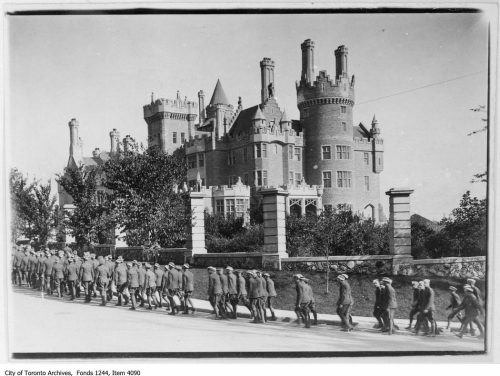 Soldiers marching on Walmer Road with Casa Loma behind, 1914. Toronto Archives. The Casa Loma HCD Study was prioritized by City Council in March 2015. The HCD Study was recommended to provide an overall understanding of the area’s history and heritage character and to determine if an HCD would be an appropriate heritage planning tool. The City Planning Division initiated the Casa Loma HCD Study in Summer 2017 and retained a project team led by EVOQ Architecture with ASI Inc. (archaeology), Urban Strategies Inc. (planning) and DTAH (landscape architects) to prepare the HCD Study report. The Casa Loma HCD Study will include a comprehensive property inventory, historical research, character analysis, evaluation of the area’s heritage value, and review of the area’s existing planning framework. The study process includes two public meetings, as well as the convening of a community advisory group to provide specific and detailed feedback on research, analysis and recommendations.